It was a controversy befitting of the race that gave us carpark-gate in 2006, Hamilton’s potty-mouthed, crash-strewn race in 2011, or Rosberg’s implicitly gratuitous error that afforded him pole in 2014. 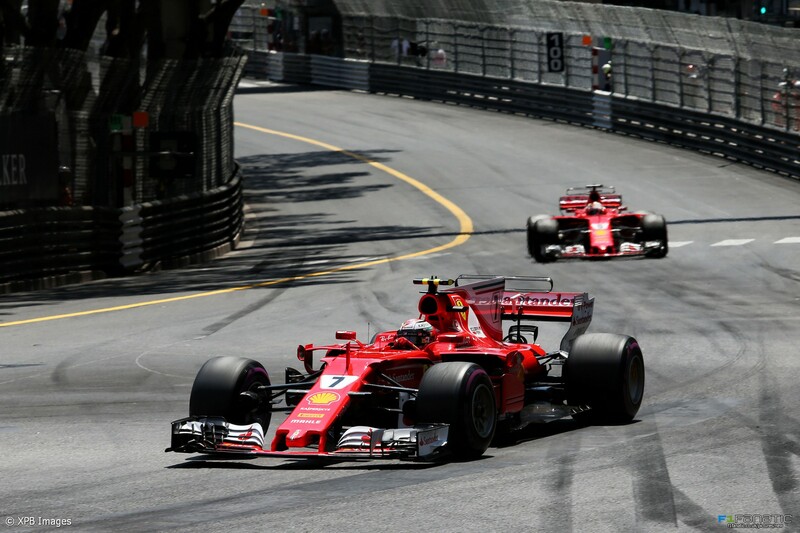 Vettel’s perfectly executed “overcut” was surely too convenient, too ideal for the Scuderia with their arch title rival down in 7th and on a circuit where it was imperative for them maximize their championship points haul. The resultant out-pourings from aggrieved Raikkonen fans pose two separate questions: firstly, did Kimi have a route to victory on his nominated strategy? Secondly, is there any cause to suggest that Vettel’s “overcut” was premeditated? Unquestionably, Kimi Raikkonen certainly looked on course for victory in the opening salvos of the face. Well-earned track position following a stellar pole lap and an assured launch off the line is generally nine tenths of a victory in Monaco. But pace has historically also been a crucial component in winning the Monaco Grand Prix. Despite losing track position through the pit-stops to Hamilton in 2016, it would take an unusual procedural catastrophe from Red Bull to deny the pace of Daniel Ricciardo. In 2003, despite losing out in qualifying to teammate Ralf Schumacher and Raikkonen, Juan Pablo Montoya would exploit the free track he had after his rivals pitted to win the Monaco Grand Prix on pace. As with Montoya in 2003 (albeit not strictly comparable given the fuel-weight disparities during the refueling era; the fuel “overcut” was a more typical approach to gaining track position), the cornerstone of Vettel’s winning strategy was his teammate’s pace, or rather lack of it. Had Kimi been faster on the ultra-softs in the opening stint and not had a strategically vulnerable delta to his teammate then there would have been no reason to react to Bottas, who had been stuck behind Sainz anyway. Kimi also could have done a better job on the super-soft – once Vettel pitted he certainly appeared to have no issues extracting pace from the super-soft from the outset. Had Kimi been faster no amount of strategic chess could have defeated him. Unlike Vettel, he had been unable to recover the ultra-soft from the mid-stint graining phase, and more generally lack paced through the all-important pit-stop window. As Ralf Schumacher learned in 2003, keeping pace through the essential in and out-laps can be as essential to Monaco success as qualifying or the launch off the line, and in that regard, Kimi lacked his calculated teammate’s ability to finesse and modulate his pace so that his car was at its fastest at the flash-points of the race. But did Kimi’s pace really matter? Did the sheer irrefutable rationality of massaging Vettel to the twenty-five points mean that the Finn’s fate had been predetermined? It is not like the Scuderia don’t historically throw their support behind a single driver, nor have ever been bashful in designating second drivers. And Kimi simply hasn’t had the pace of his teammate ever since their congenial partnership began in 2015. Yes, Raikkonen was sometimes able to nose ahead of Vettel at times in 2016 whilst the German was suffering some now long forgotten cumulative frustration, but in every clean comparison, every dynamic, demanding scenario, it has been Vettel that has been the prow of Ferrari’s assault. So why shouldn’t the Scuderia back their main man? 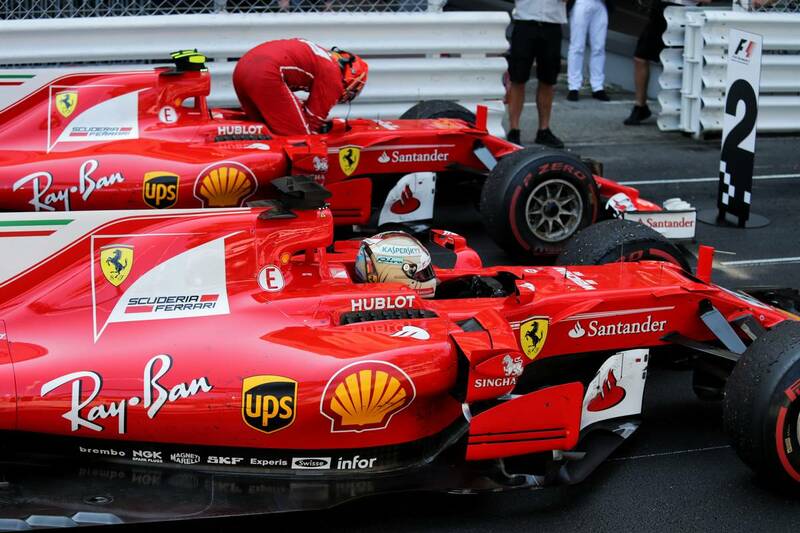 Vettel pits on what would be the winning strategy. A strategy by premeditated foresight or honest chance? A perhaps less philosophical question is whether Ferrari tactically gave Vettel the ability to perform the “overcut” or whether they honestly overestimated the performance of new super-soft. With absolutely no championship agenda at play at all, the exact same dynamic took place at Red Bull, with Ricciardo performing the “overcut”, not only on teammate Verstappen, but on Valtteri Bottas too. The fact that Red Bull spit their strategies, with Gianpiero Lambiase banking on the performance of the new super-soft to climb Max up the order with the more traditional “undercut” (albeit only to misjudge the pit delta to Sainz) and Simon Rennie exploiting the performance of Ricciardo’s ultras, is indicative of the strategic ambiguity at play. Feasibly, Kimi’s engineer Dave Greenwood made the same mistake as Lambiase in overestimating the performance of new super-soft. Of course, the “overcut” has had some historical success in the Principality: in 2012, Sebastian Vettel used an “overcut” to climb from sixth to fourth, and prior to 2010 the added fuel weight disparity meant that the “overcut” was the principle method of gaining track position in Monaco. However with the warm-up implications of the harder, wider Pirellis in 2017, surely the “overcut” has been brought into greater strategic focus? However whilst it was effectively an “overcut” on Hamilton that gave Vettel track position in Melbourne, that came with assistance from the old tyre-shod Max Verstappen as a roadblock for Lewis, and in Sochi, a circuit infamous for warm-up issues (often resulting in multiple warm-up laps before a qualifying run), the new super-soft produced purple sectors from the outset. Ferrari could believably claim to have put Raikkonen on the optimal strategy, and equally Ferrari could feasibly have foreseen the “overcut” scenario and lined up the dominoes in favour of their lead driver. However if the later was the case, if Vettel’s “overcut” was premeditated, then it would be a plot reliant on the kind of speed and pace differential that justifies the Scuderia’s faith in Sebastian, and on the flip side would require from Kimi the kind of inconsistency and inflexibility that justifies more diminutive team favour.